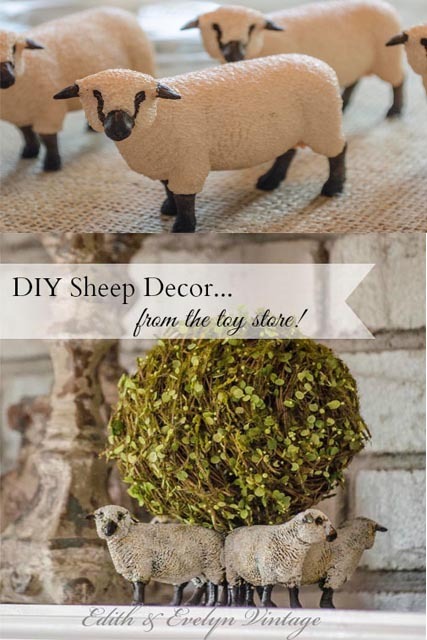 How to Create DIY Sheep Decor Using Toys from the Toy Store! 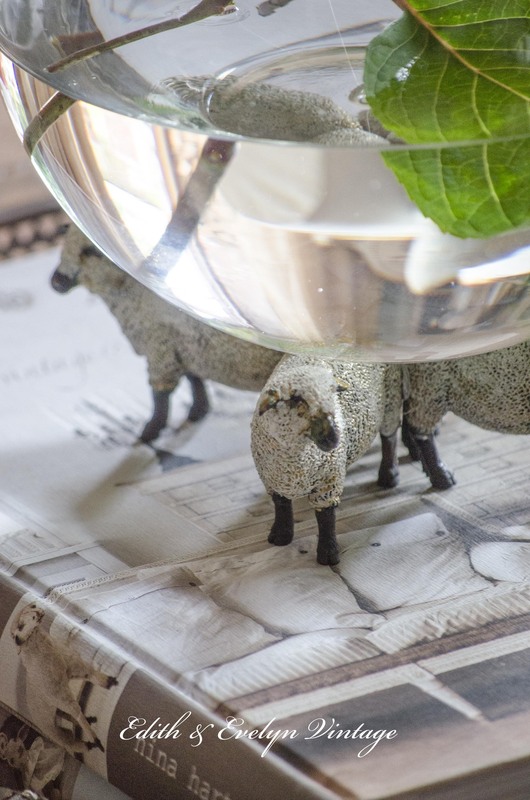 Y’all know that I love sheep and using them in our french home decor. Recently I was shopping in a toy store for a birthday gift for our grandson, and happened to walk past a large bin filled with farmhouse animals. 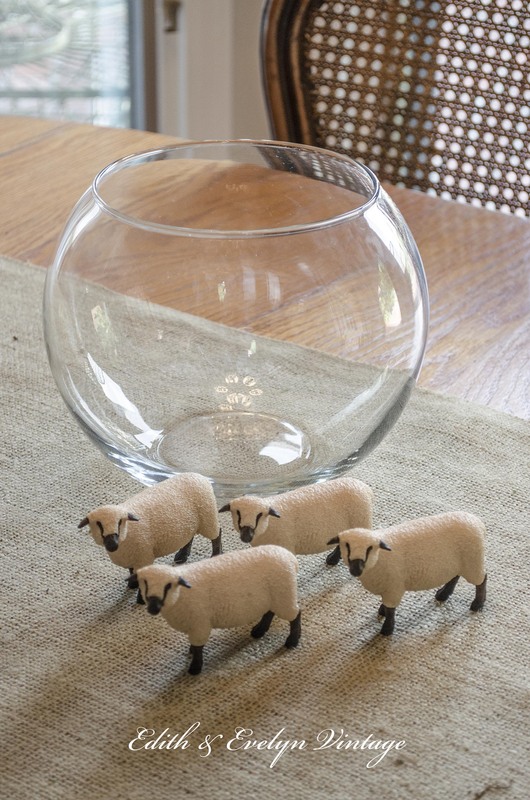 Of course, the sheep figures (affiliate link) immediately caught my eye. They were so stinking cute! I stood there in the toy aisle, holding one cute little lamb in my hand, thinking there had to be something that I could do with them. So I purchased several and brought them home. The “plastic toy” look had to go, so I knew that I had to paint them. Originally, I thought I wanted a gold metal look, something that resembled old brass, so I started by painting all of them solid black and then layered a brassy/bronze metallic paint over it. But it just wasn’t what I had envisioned, so on to Plan B.
I ended up getting out the chalk paint and dry brushing ASCP Old White over the top of them, leaving the bottom legs and parts of the face black, to give them some definition. Dry brushing them also left bits of the gold showing through, and I liked this result. My idea was to form them into a base or pedestal of some sort so that I could change out the display for different looks. So I took a hot glue gun and glued their cute little bottoms together. And here’s what I ended up with. 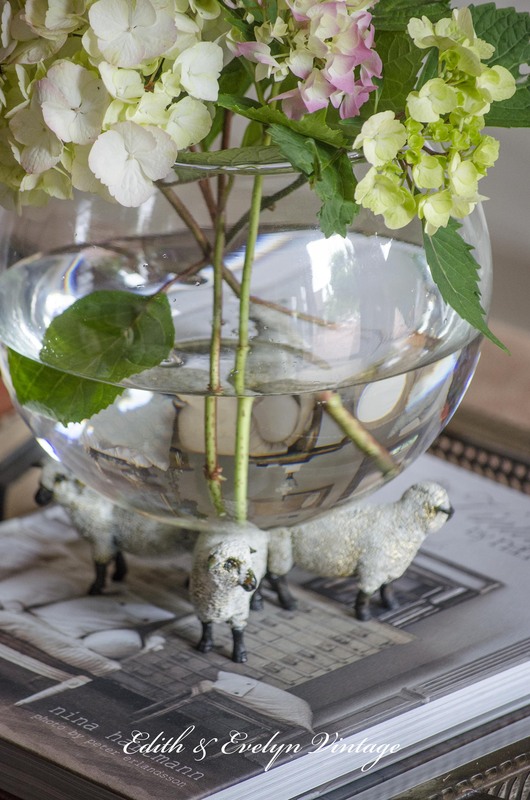 Placing a round glass vase on top (from Hobby Lobby), made the perfect French farmhouse vase for fresh cut flowers! I also tried it with an ironstone bowl, using it to hold the scrubber by the sink. You could also easily use this for holding soaps in the bathroom. 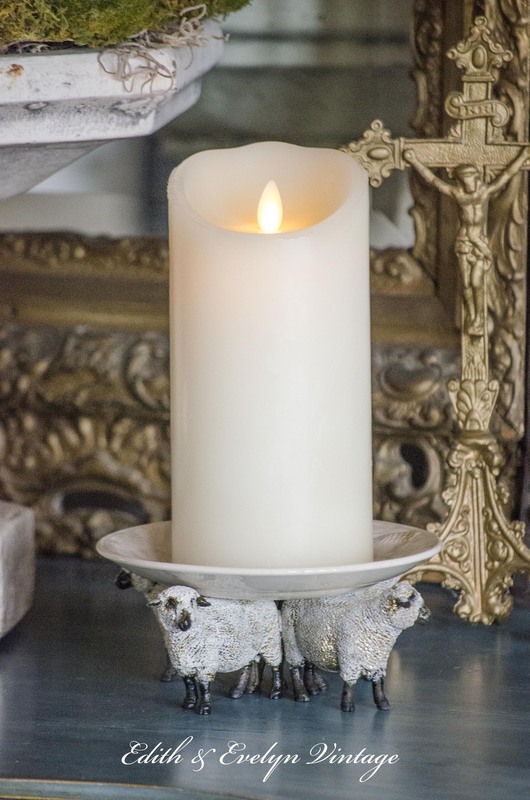 Using a small ironstone saucer, it makes a perfect base for a candle. 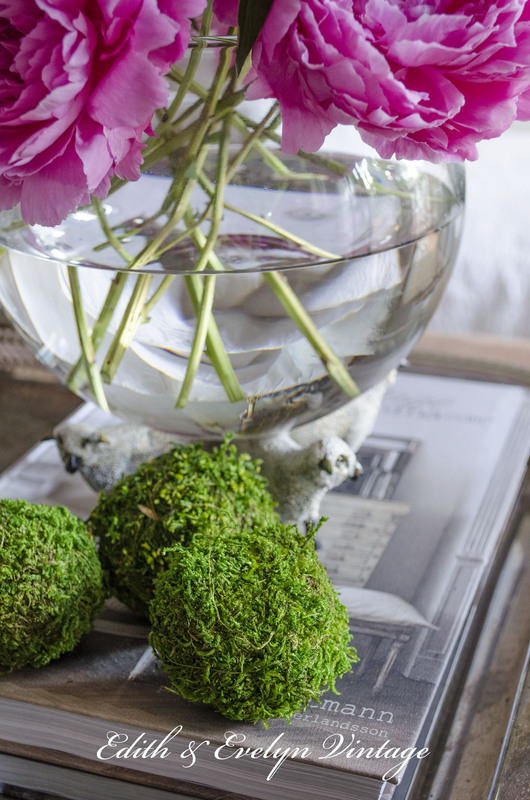 And this may be my favorite, sitting on top of the fireplace mantel, simply holding a moss ball. 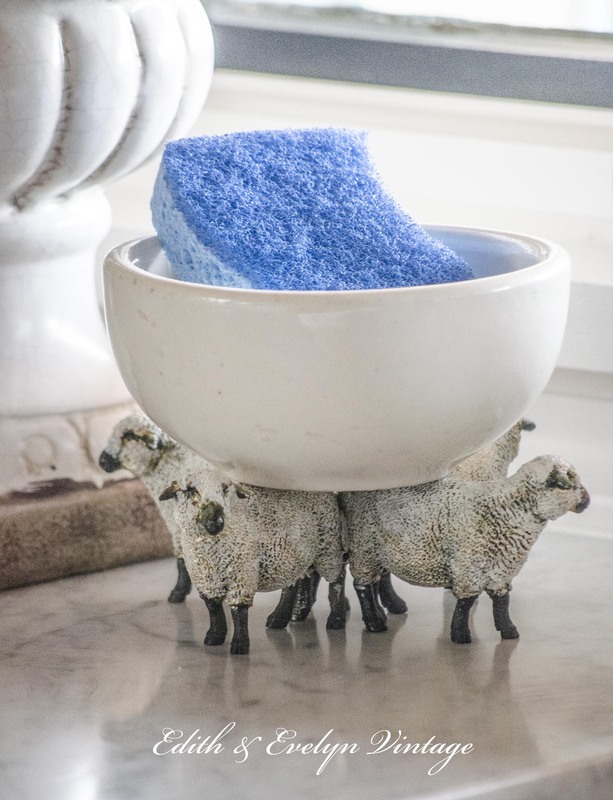 There are so many different ways to use this DIY sheep pedestal. If you love cows, pigs, or horses, you could use those toys instead! How cute would this be for an Easter table?!? 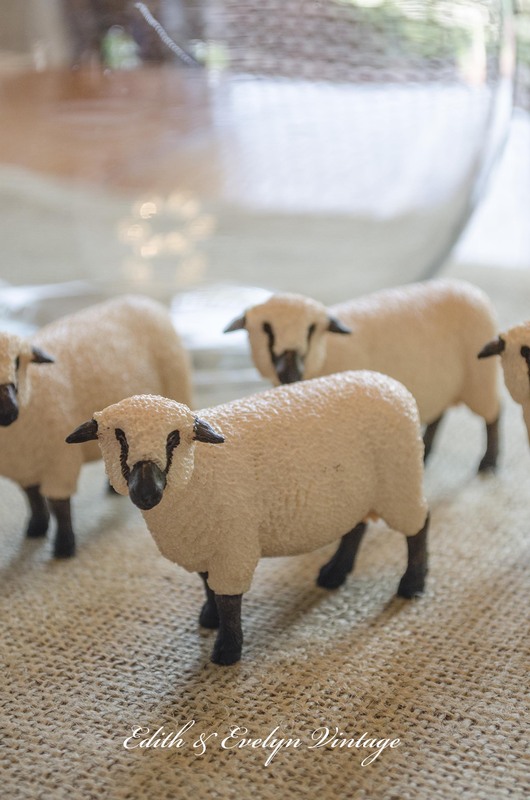 I bought several more of these little toy sheep and I think I’m going to make one to sit on my desk for a business card holder. I just need to find a small silver tray to sit on top. So tell me, what would you use this for? I freaking love this idea!!! I love sheep & rabbits. Going to look at them when I’m at Target or Michael’s. Thank you for the inspiration!! That’s wonderful, Susan! Thank you so much for commenting! Hmmm.. not baaaad. Couldn’t resist that. Absolutely flipping brilliant! Great idea. I love this!!!! I have often admired your sheep!!! I will be trying this if I can find the sheep!!!!! Thank you much and have a great weekend!!!! Hi Denise! Unfortunately, this piece has already sold. 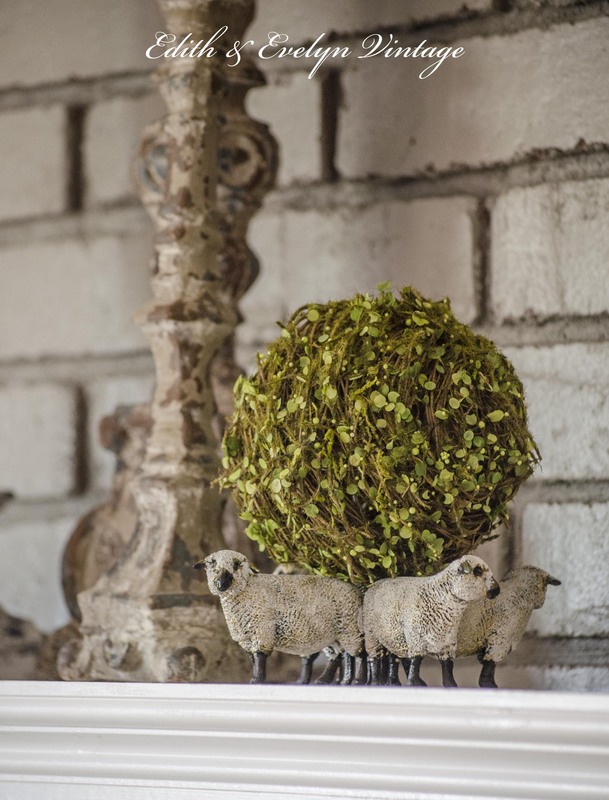 I absolutely love the sheep! What a fantastic idea! I’m going to Tractor Supply tomorrow! Oh my goodness! I am so excited to see this! How simple but yet turned out so sweet. I am going to go and hunt down some sheep. I love them with your ball of greens on top. I LOVE your DIY sheep. Is there a way to order them online. Our biggest toy store closed and everywhere I looked I can’t find them? I love them with the moss ball!! It looks like they ar on the look out while shenanigans are going on in a bush!!! This is so talent, creative, and gorgeous that its beauty leaves me speechless. WOW! what a clever idea. I’m always looking for things that I can take and repurpose. Thank you for sharing. These little guys look like they are from another time Old World. Good Job. No need to answer…. I just found the answer to where in one of your comments. They look great! So cute! Where did you but the sheep? 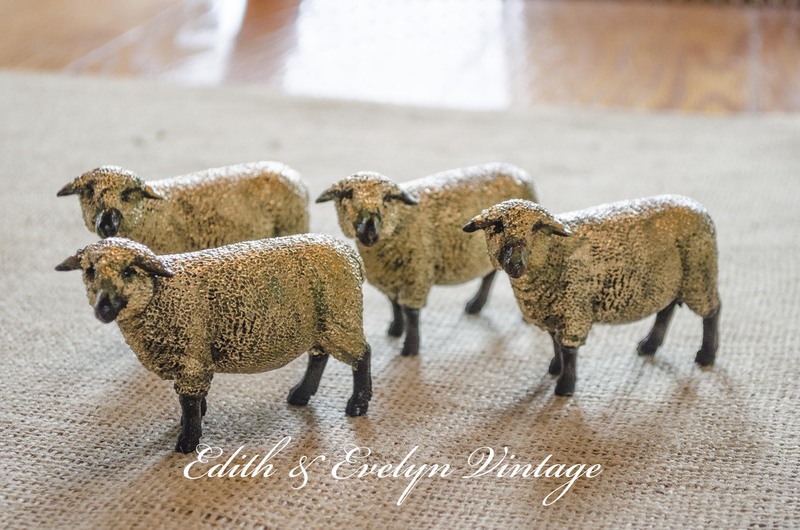 Even before you did your layered paint to them, they look like really nice sturdy sheep. Love all of your ideas, and what a creative way to use these sweet animals…always inspired by your ideas..can’t wait to get out today and see if I can find some for myself! Hope your day is blessed…. I found 3 of the sheep today at toy store !! so excited to have found the little cuties!! Wish I could find an old picture with sheep in it too. Thank you ,for this super project !! That’s awesome Paula! So glad you found some! I love this idea. I would love to have them for the dish we put our keys on. What a fabulous idea! It looks like something you would purchase at an antique market. Very clever. Cindy, this is one of the most clever ideas I’ve seen. Great job! I’m always looking for something to elevate a piece. I’ll keep this idea in mind should I find something that would work for me. Yes, very, very clever! And oh, so charming! Thank you Sarah! This was such an easy project and so versatile to use in different ways! I loved this idea!! So cute!! Could you please tell me the author of the book ViNTAGE that was under the sheep in the first picture! It looks like one I would like to own. You have a very creative mind!! Thank you Sheryl! The author of the coffee table book that you are seeing is Nina Hartmann. Her books are amazing and filled to the brim with vintage eye candy. Here is the link to her website http://vintagebynina.com/vintagebynina-books-2. I believe they may all be sold out though. She is a Swedish designer and we are one of the distributors for her new books as they are released. She has her newest book being released in September and we will be carrying them. We only have a limited quantity when they are available and they usually sell out quickly. I LOVE this idea!! It has struck my fancy beyond imagination! You are an inspiration on so many levels. Thanks for everything! That is an absolutely adorable idea!!! Thank you so much for sharing….I see a Michaels visit in my near future!! I might use them for drawer pulls. I wonder if you could dip. In plaster and let dry to get plaster figures? Trip to dollar store in my near future!! They would be so cute as drawer pulls, especially on an old chippy cabinet! Hmm…the plaster, now that is an intriguing idea. I may have to try that. So adorable! I love this idea, as well as all your blog projects! I never would have thought to make a base out of four sheep. What a clever idea and so versatile to use in so many settings. Love what you do. Wow! I am speechless! I notice them in an earlier post and loved them! 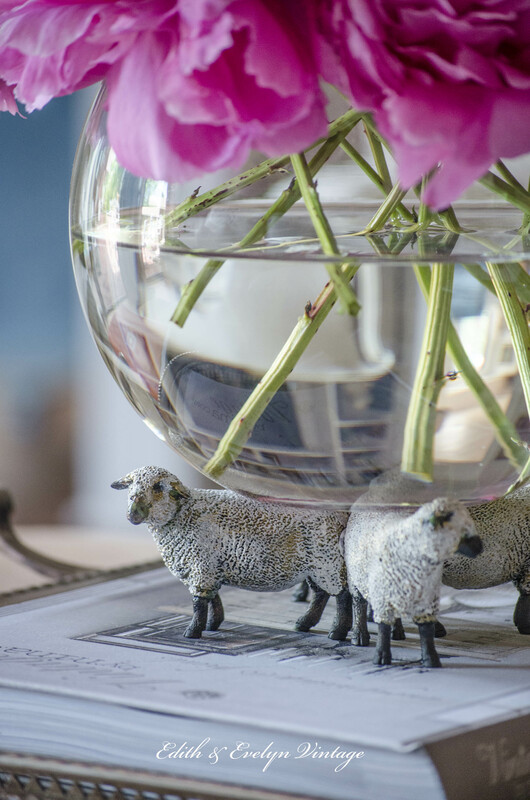 never imagined they were toy sheeps. 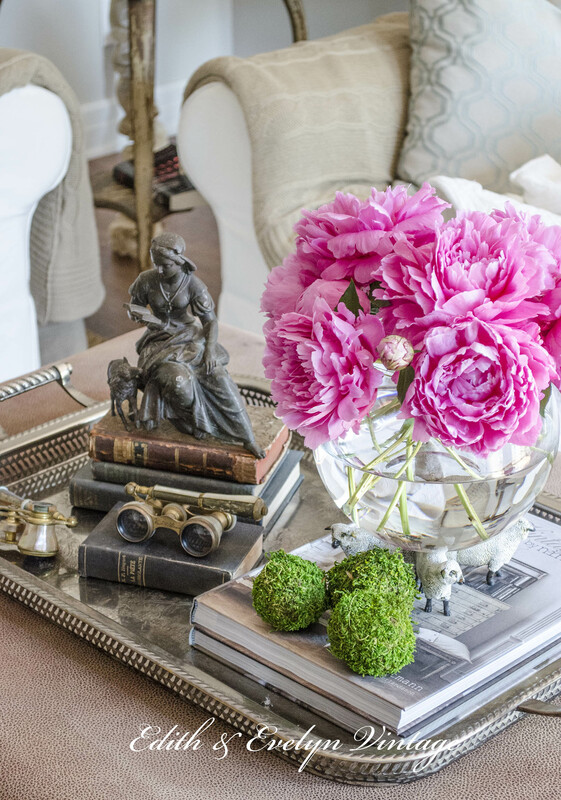 It looked like a french antique stand, part of the vase! You are so cleaver and creative! I love your kitchen counter tops, are they Carrara marble? I have Carrara in my bathroom counters and I would love them for my kitchen as well, but the company who installed them didn’t recommended them for the kitchen. They said they were very delicate to survive in the kitchen. What is your experience with it and would you recommended it for kitchen? Thank you Cristina! Yes, the kitchen counters are Carrara marble. Some stone companies just refuse to sell it for a kitchen. Carrara isn’t as hard as some other stones and will etch and stain. I knew this going in, but I have always loved the way old marble counters look in the European homes and French patisseries. The “patina” they acquire after years and years of use appeal to me. That being said, marble in the kitchen is not for everyone! If the occasional scratch or etching from the acid in a food will bother you, then stay away from it! We went with honed marble and sealed it with a marble sealer, which will need to be resealed every so often. Just make an informed decision. 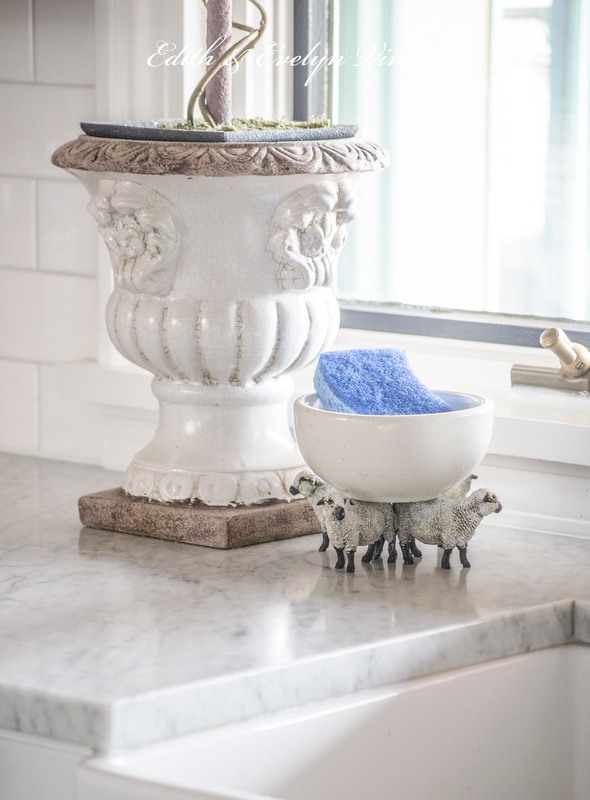 There are some granites and other stones that mimic Carrara, so there are other options if you’d rather not deal with the “patina” that Carrara will undoubtedly acquire. I love ours but it’s definitely not for everyone! Thank you so much Cindy! This is very helpful information. I appreciate your advice! You know you’re going to cause all the toy stores to sell out of sheep now, right? It’s such a sweet idea and now we all need to try it! I love the way the finish turned out with all the layers…very pretty. Lol Judy, maybe there will be some cow and pig lovers out there and all the sheep won’t sell out! Awww, thank you Dale! Be careful…..you can never have just one french chair!! Ditto everything everyone else has said! Just amazing how your mind works. Thank you for the inspiration. I collect birds for the Biblical meaning they represent and now want some sheep too. Ah, yes, love the spiritual symbolism of birds as well! Sweet Holly, thank you so much, I’m feeling very blessed today by all the kind words. Hmmm…..an E&E Happy Hour would be awesome!! Really, really, cute and useful idea! Brilliant idea Cindy!! I love all the ways you used them! When I wrote to you last week asking about them after spotting them on your May post I had no idea that they were toys! You told me you were going to devote a post to them and now I understand why! I love sheep too and they are especially adorable! Very inspirational, thank you! I also love sheep, alive or toy. Have been collecting unusual or striking, to me, in some way. Some of them are out all year but all come out at Christmas. They reside under the den Christmas tree which is decorated with ornaments of pine cones, acorns, birds nest, two baby owls, and two pheasants. I love each and every piece as have collected them for years. And almost every time I look at them it reminds me that “we are the sheep of HIS pasture”, loved and cared for by God Almighty.. Yes, love that Alice! 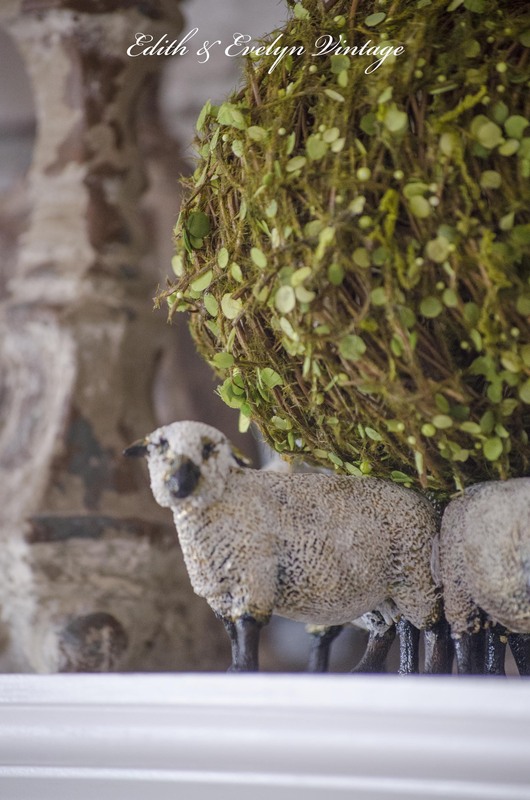 One of the main reasons I love the sheep is what they represent to me spiritually. Well said. So creative and absolutely adorable! I love how you are using them as a base. Wow. Flabbergasted I am. You creative genius, you. Wow. I bow to your awesomeness, Oh Great One (she added sheepishly). Oh my word….this is so clever, refreshingly different and still beautiful! I was admiring them in a photo in an earlier post thinking it must have been an antique of some sort! Fun! You are so creative! What would I use this for? I would probably steal one of your ideas! Ewe are so clever. I love this idea and would never have thought of it. 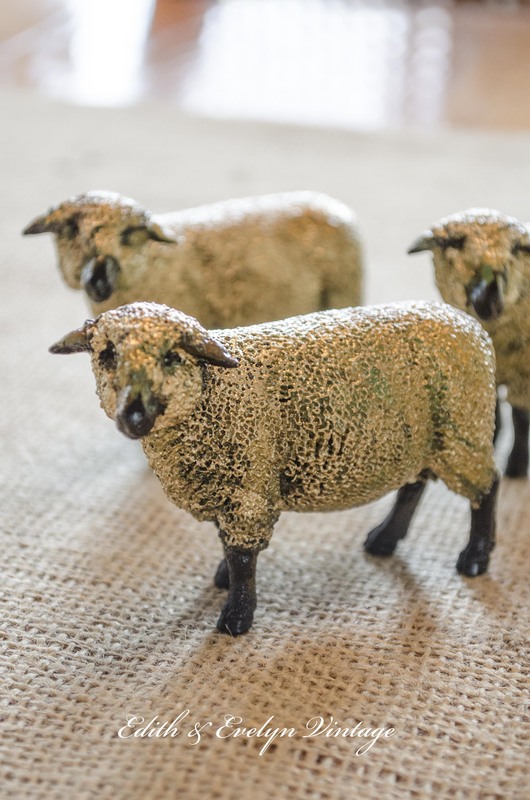 Oh my gosh….this is waaay too cute and over the top creative!….Love, love it…I am now on the hunt for cute sheep like these…Did you get them at a big box toy store or a specialty toy store?….Crazy cute!! Thank you Shirley! Found these at Toys R Us. I am in awe! 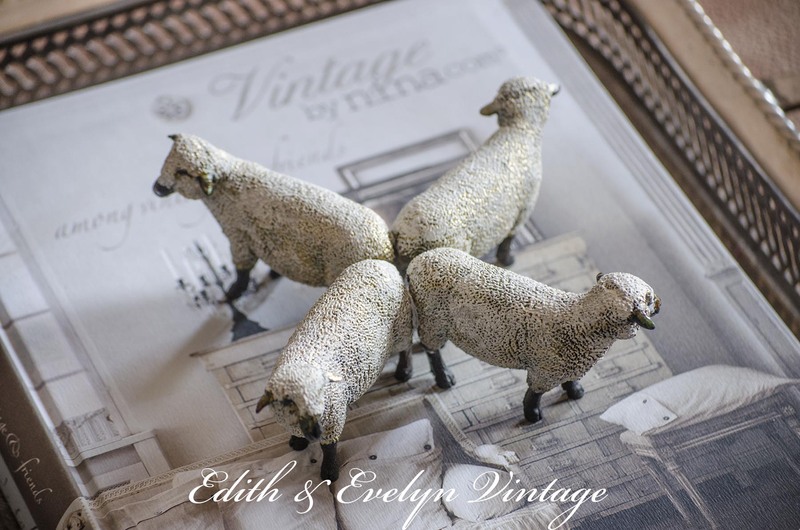 I like to think I am creative (and I love sheep), but I would n.e.v.e.r have thought of painting these toy sheep! Never. 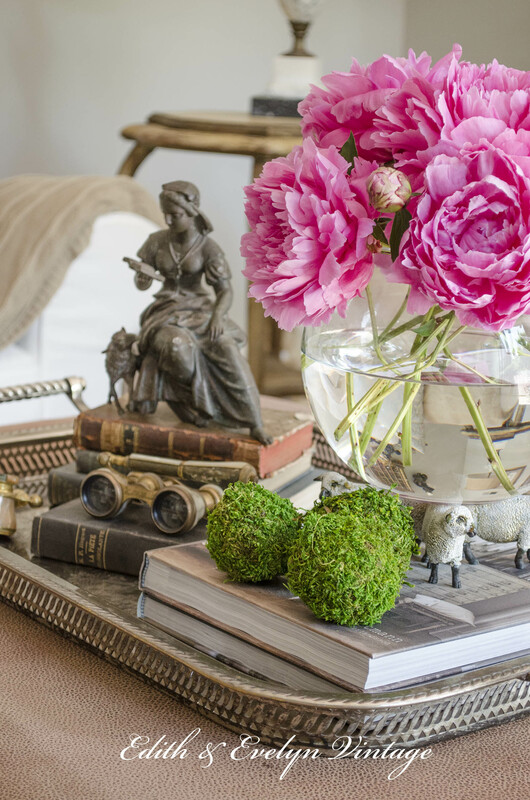 And then, to use them as you have as a charming base for all manner of decor…………I am loving it. Adorable!! And all from a toy bin! The possibilities are endless. No sheep are safe around you!!! Love what you did with them.